Samples of patent management systems offer web links providing patent application template. It enhances the worth of your system by providing straight admittance from the patent on the organization to a same patent on the patent office website. The patent application system also has a regular deadline calculator that robotically prompts patent deadlines that based on the kind and date of patent filing. You can also see Job Application Template. 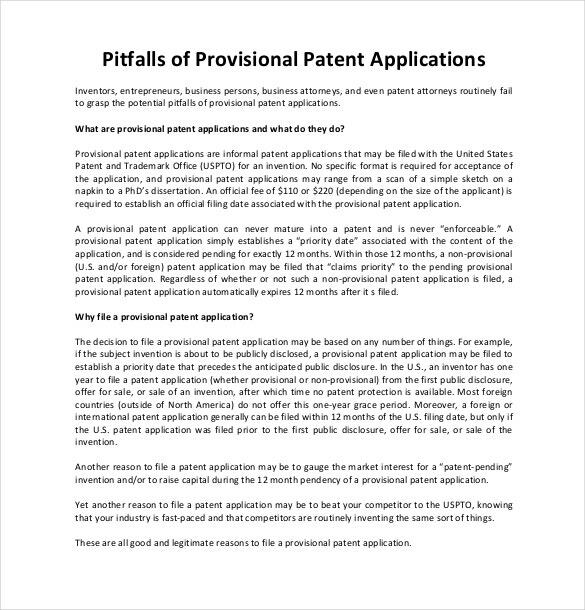 These Application Templates formats have their detail revelation modules that update the customer about new necessities, forms and other reference from the patent office websites. It gets the latest forms from patent websites for example that are presently used in filing, regeneration and upholding of patents. Patent application is a must when you have invented something of your own. 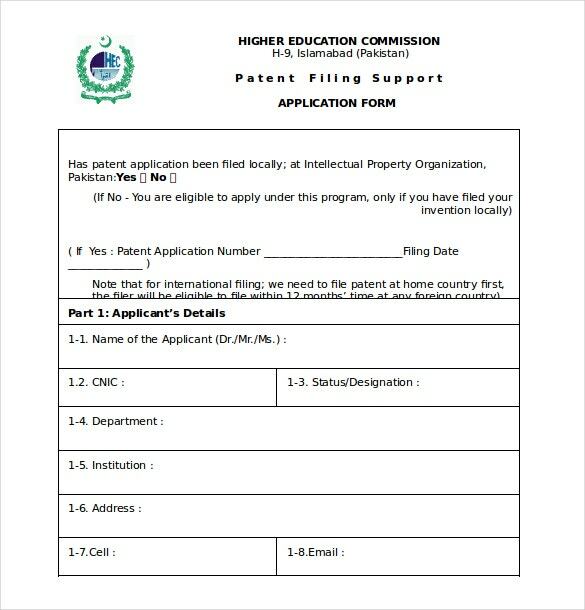 These patent provisional application forms are a must when you are applying for a patent. You need to fill in some basic information which includes your personal information, and the title of your invention. 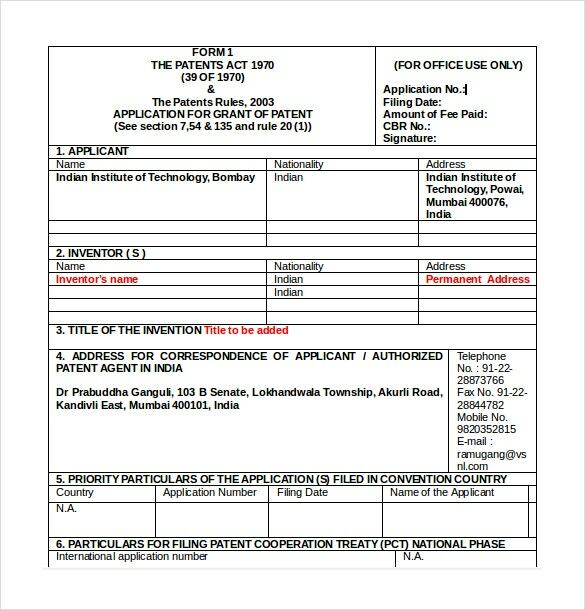 This template includes a sample patent application of an Indian inventor. 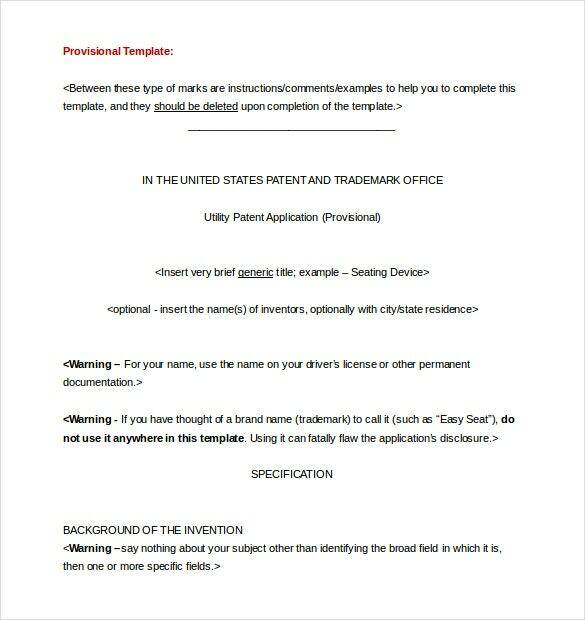 You can download this template to get an idea regarding a patent application form. The required fields in this form include the personal information of the applicant, personal information of the inventor, the title of the invention etc. This template includes a free sample patent filling support application form. 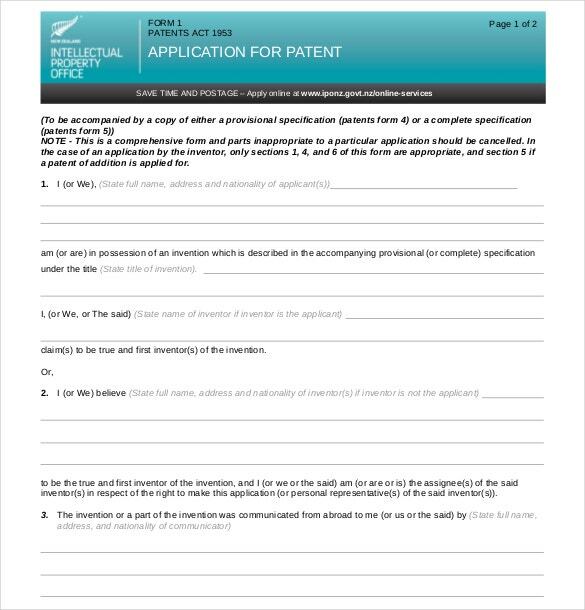 A patent application form is a must when you are trying to get a patent for your invention. 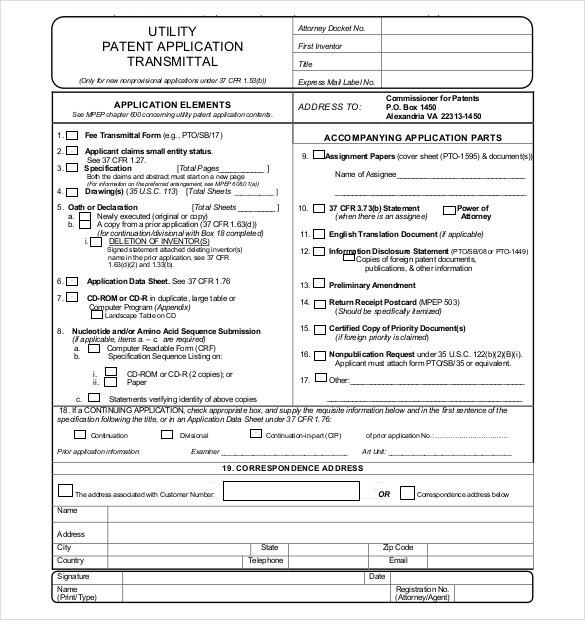 You can download this template and get an idea and design your own patent application form. The patent is something that you must get on time for your invention. 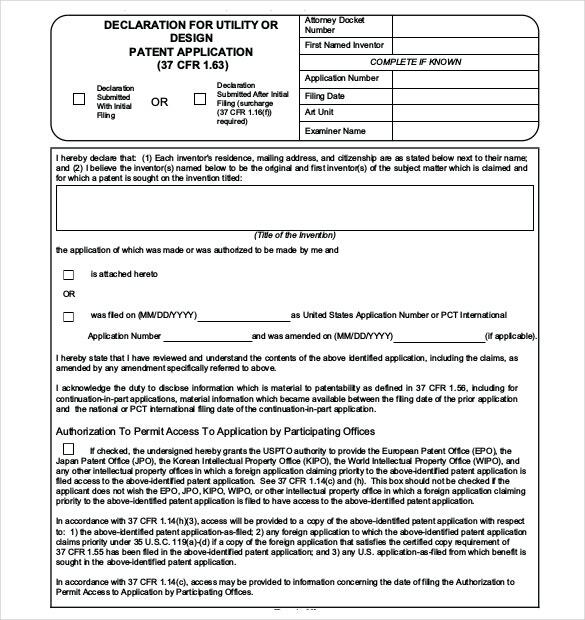 To get this patent, you need to fill in a patent application form. 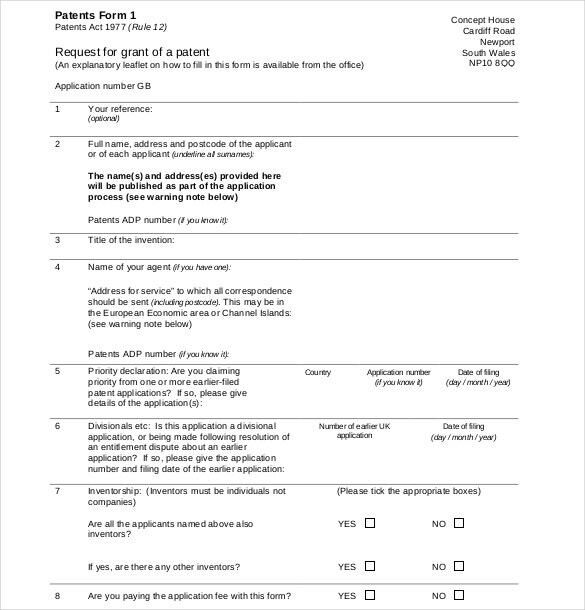 This template consists of a sample patent application form which takes in various details such as the background, summary and a brief description of the invention. A patent application template can prove useful while applying for patents. It can help to highlight the key points relating to the patent application. While creating a patent application template, few important aspects must be included in it. These are essential features for applying for a patent. The template should enable the applicat to describe in a few statements the nature of the invention. This section can deal with providing a brief description about the current state and position of the art. The template can require the candidate to mention few points regarding this aspect. This section of the template may require the applicabt to describe in brief every drawing and flowchart. Flowcharts may be required in software and other types of patent applications. The application template may also allow applicants to consider flowcharts as a form of logical diagrams depicting the flow. This section of the template is the one where the applicant may be asked to describe his invention. It is in this section that details regarding the invention may be provided by the candidate. The template can also ask the applicant to describe the preferred and different embodiments. It has often been observed that a better description increases the chances of securing the patent. In this section of the template, the drawings and flow charts used previously may be linked with the description for better understanding about the invention. Each element mentioned in this section of the template should have an element number that links to the element described in the drawings. 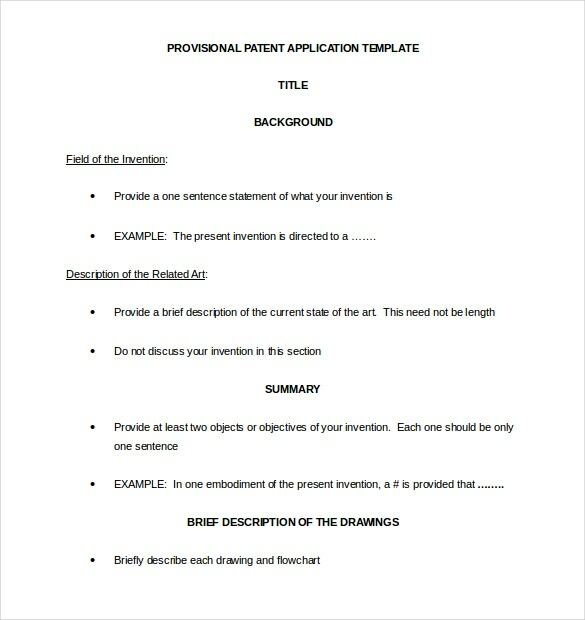 This section of the template is the segment wherein the applicant can claim the invention. This segment usually requires a single sentence recitation of the invention. 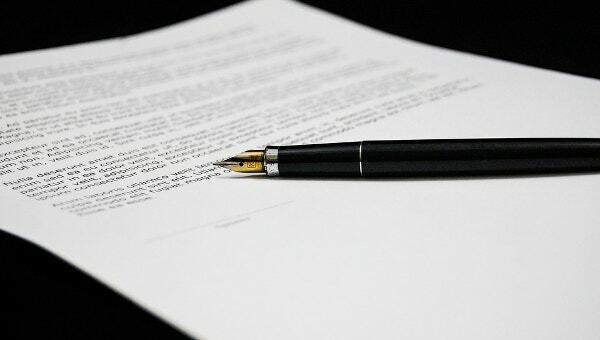 The patent application template must consider the use of legal language for defining terms and conditions. Disclose all prior patents the applicants have information about. Information regarding pending lawsuits regarding the patents. Information about any other contracts or license agreements that may effect the patent application procedure. A patent application form is a request filed to get patent for your invention. You need to get a patent for all your inventions to protect your invention and giving a name to it. These patent application form templates will be needed to get a patent for your invention. You can download any of these templates, fill up the required information and get your work done. The details required by these patent application forms are personal details of the applicant and the inventor, description about the invention and sometimes they need few drawings of the invention. A patent application form is used by anyone who has an invention of their own and wants a patent for that invention to protect it. These templates which consist of patent application form samples are mainly used to grant their invention a patent. They require the inventors to fill in few required details about them and about their inventions. Once they fill in the form, they are required to submit it to the patent office. Once the patent specification complies with the laws of the office concerned, a patent may be granted to the inventor for the invention described. Most people are not aware of the importance of a patent and the procedure to be followed while filing for one. These templates will help the applicants get an idea regarding the patent application form. 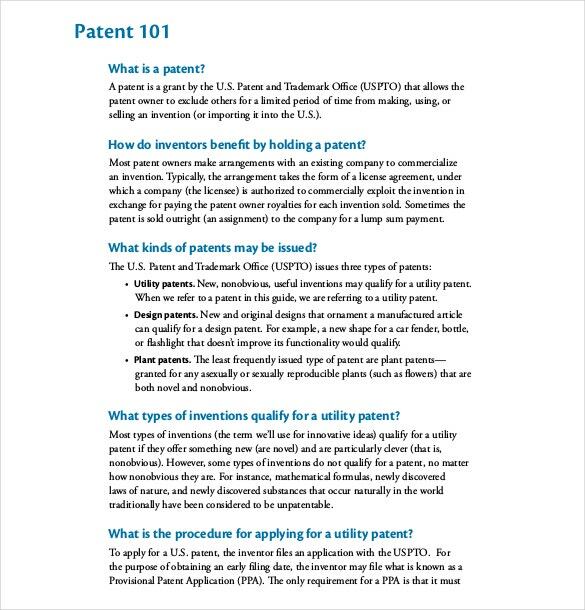 They can download these templates, print them and fill up the details directly or use these templates to get an idea and keep all the details with them prior to going to the patent office to apply for a patent. Filing a patent is important so you can prevent others from copying your invention and get a copyright on that. If you are looking for readymade patent application forms, then these templates are perfect for you. 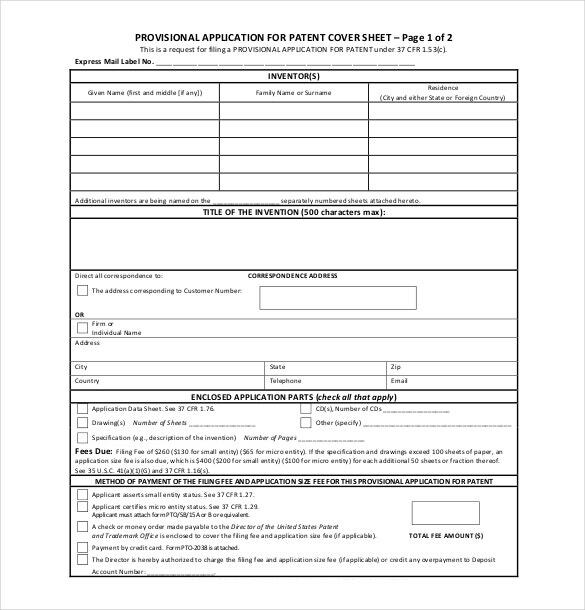 You can also download these application form templates, get an idea regarding the procedure that need to followed and the details required and then go to the patent office and file for a patent.